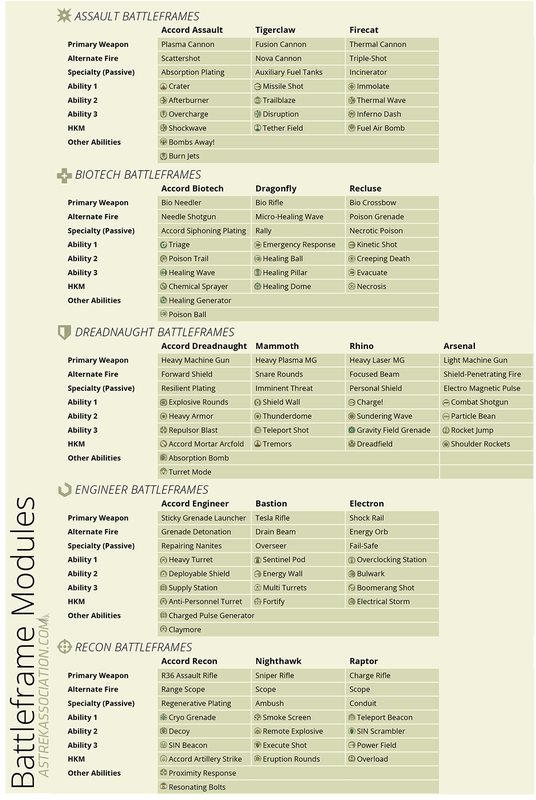 I’ve found myself constantly referring to my list of battleframe modules, especially as I get around to trying out new frames and working out which abilities I want to use. I’m sure I’m not alone, so I thought this cheatsheet might be handy. It lists the primary weapons, ability modules, HKMs and passives for all battleframes. Click on the image for a larger and more readable version, or scroll down to download a high-res PDF for printing. Don’t forget that the advanced frames can accept modules and weapons from the Accord frame of that type, too! As always, do let us know if you find our cheatsheets helpful, and feel free to make suggestions if there are others you’d like to see. Hi Siha, I just wonder you got my E mail which is quote your information, translate and post at somewhere else. Short of time so just leave a short msg and if you need a detail, Il let you know. Have a good day! Hi – glad the cheatsheets are useful! And unfortunately no, gear from an advanced frame can only be used on that frame. So a Recluse can use everything from the Biotech and Recluse gear lists (including the two non-default modules, Healing Generator and Poison Ball), but not any Dragonfly gear. I think this is a change from the most recent patch, but Chosen Plasma Cannons now have the Triple Shot alt-fire, whereas any Accord Plasma Cannon has the Scattershot alt-fire. isnt bastion alt. attack is Repairing Beam? That’s its effect, at least in PvE, but according to the patch notes when it was reintroduced as the Bastion weapon (Patch 0.6), it’s officially called Drain Beam. Can we switch abilities between 2 frames? like for example.. Im gonna use the Firecat frame but I want the ability of the Tigerclaw’s missile shot. I know we can switch abilities between the default frame and the better frame but I don’t know if we can switch between the 2 better frames. No, you can’t. An ability from an advanced frame can only be used on the frame it came from. Only Accord frame abilities can be used on other frames.